The utilization of search engine optimization (SEO) is not a new concept or element to any digital strategy, yet it’s 2019 and we’re still talking about it. Differing from humble beginnings, SEO has transitioned from being solely focused on strings of keywords and page optimization to now factor in the likings of content creation for niche authority, link-building and social media marketing. Just because SEO has moved away from sole dependence on keywords doesn’t rule out the importance of utilizing keywords strategically in marketing strategies. If you were asked how to positively influence your business’s SEO, utilizing common keywords associated with your specific brand or niche is a great jumping off point; but have you considered the use of keywords within user reviews? Often times, when a customer reviews your business and provides their experience, they’re going to use some relevant keywords within their response; helping to distinguish your company from a competitor. Not only this, but you can utilize these keywords within your response to their review, too. Still, the world of SEO extends far beyond the use of keywords in any setting or regard. When trying to enhance your SEO, you’re likely aiming to rank higher on search engine result pages (SERPs). Search engines, such as Google, are constantly changing up their algorithm and keeping tight-lipped about what exactly goes into said algorithm. Though this can be frustrating for those aiming to master Google’s ranking algorithm, they constantly modify it so that people can’t manipulate their placement outside of general SEO and SEM practices. 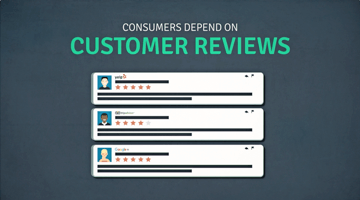 One tool you can use to optimize your ranking is customer reviews. Google and other platforms have shared that receiving new and authentic positive reviews can place your website higher on search queries. To acquire more reviews, we suggest following the 3 steps below. To acquire reviews from your customers, a great place to start is by simply asking them for feedback. 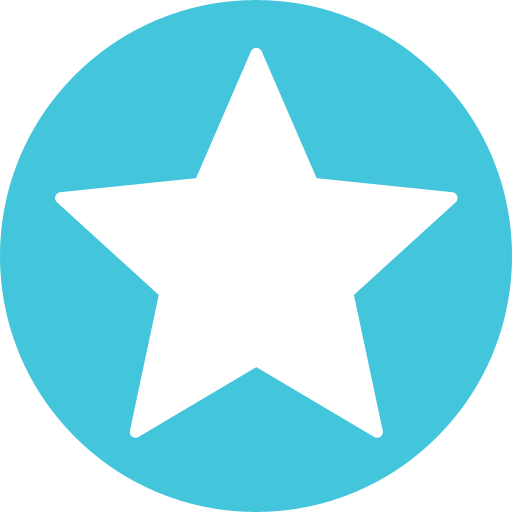 ReviewPush’s customer experience solution has a feature that allows you to send feedback request emails and text messages to your customers who have recently had an experience with your business. By doing so, the product they bought and the experience they had with your business is still fresh in their memory, so you’re more likely to get the authentic feedback Google and other search engines look for when optimizing rankings. Though there is no way to determine whether a higher number of recent reviews will place your site at the very top of page 1 for a search, it will help optimize your ranking on SERPs. To ensure you’re compliant with various review sites and GDPR, make sure to segment out the emails and texts you’re sending throughout a day or two, and ensure the email addresses and phone numbers you intend on reaching out to have been given to you at-will by the customer. You’ve received a handful of gleaming reviews — now what? 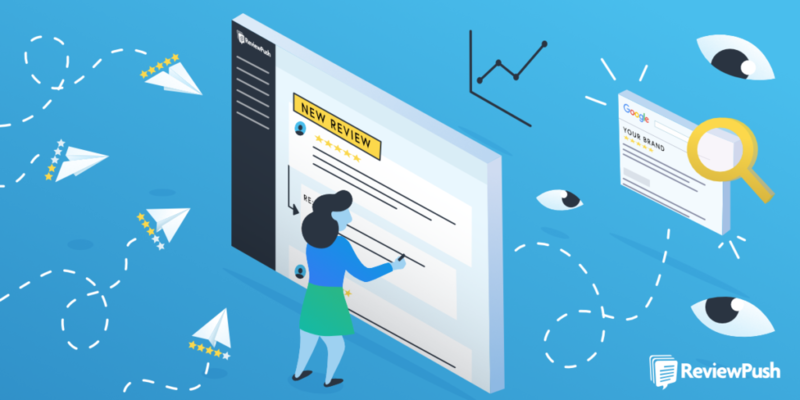 It’s one thing to get a review from a customer, but that’s merely the starting point of ramping up your SEO through customer reviews. When someone takes the time out of their day to give you valid feedback, good or bad, you should definitely acknowledge it. On Google reviews, users are now notified when a business has responded to their review, and many consumers who leave reviews do so to open a dialogue with the business. By responding to your reviews, you’re showing your customers that your business cares and values their opinions and experiences. Google recently stated that your business’s digital prominence plays a role in your rankings on a Google search. What this means is that Google’s team and the algorithm they’re constantly updating look at your business’s involvement around the web like the credibility of articles written by your in-house content creator that are live somewhere on the web, and the usefulness of content on URLs associated with your business. If your business isn’t positioned in its best light, you could be hurting your SEO without even knowing it. A simple solution to create usefulness out of your URLs, or those associated with your company, is to engage. If you have a blog that has several comments and conversations happening on it with no responses from your business, now’s a great time to dive into the conversations and provide feedback and answers where you can. Secondly, you can easily begin repositioning your business for SEO purposes through review responses, too. If a customer had a less-than-admirable experience, thank them for their time, offer any necessary sympathies, and figure out a way to open a dialogue with them to ensure the issues are eradicated. This will prop up your business and show that it has heart, and the people behind it care. At the end of the day, it’s all about putting the customer first. By creating helpful content within heavily-used URLs, asking your customers for feedback and responding to reviews with keywords and authenticity, you’ll be off to a great start in the grand scheme of SEO. For help responding, requesting and repositioning your business — and everything in between — there’s ReviewPush. Check out ways we’ve impacted our customers businesses to gauge the results we can get for yours.